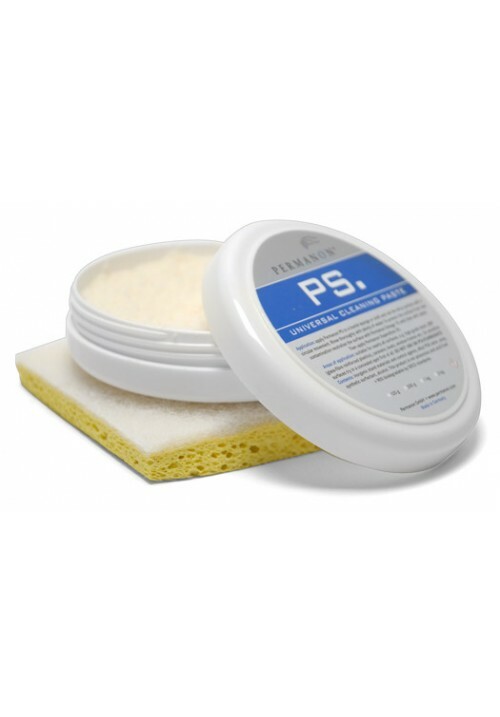 Permanon® PS Paste is a completely different (and very effective) cleaning product based on a mixture of high quality all natural soaps instead of the conventional abrasive compounds usually found in cleaners. This product is almost pH neutral (PH 7 to 7.6) and is non-abrasive. It cleans more effectively than other more aggressive cleaning products; it will remove difficult organic fouling without damaging the surfaces or even removing the shine. Great for sensitive surfaces and heavily soiled areas, it beats all other products by its sheer effectiveness. Use Permanon® PS Paste once, and you will be convinced. Permanon® PS Paste is non-toxic, non-fl ammable, solvent-free and completely biodegradable. Permanon® PS Paste is not compatible with polycarbonate plastics. DO NOT APPLY, hazing may occur. Removes virtually any stubborn organic stain without abrasives or harsh solvents. Removes carbon fouling, scuff marks, cosmetic and lotion stains, and a wide variety of other aggressive organic deposits, including oil and grease. Made from pure soaps blended to reinforce the cleaning power of each individual soap.